STEM earns the PLTW Distinguised School 2018-2019 Designation! January is National School Board Recognition Month Let our school board members know how much their work for students is appreciated. Due to the threat of inclement weather, the RISD Annual Fall Festival has been postponed. 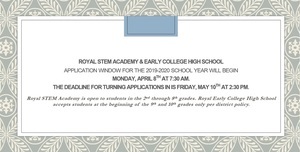 We will keep our RISD family updated with the new date. Thank you for your support!